This unit doesn’t get placed on the battle map during deployment. 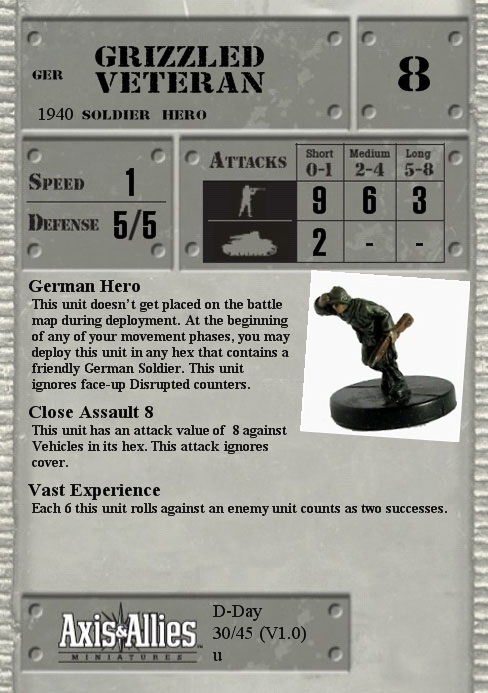 At the beginning of any of your movement phases, you may deploy this unit in any hex that contains a friendly German Soldier. This unit ignores face-up Disrupted counters. This unit has an attack value of 8 against Vehicles in its hex. This attack ignores cover. Each 6 this unit rolls against an enemy unit counts as two successes. Q: If a single Soldier is already mounted on a Heavy Transport unit (capacity 2), could a Hero be placed directly into the transport unit with it? Q: Can a Hero be placed into a hex already at the stacking limit? A: Heroes can be over-stacked (by 1, as per the stacking rules) when they are placed. Q: When you place a hero in the beginning of the movement phase is it allowed to move as well? A: Yes, the initial placement of the hero doesn't count as movement so he can move as normal. Q: Can a Hero be stopped by defensive fire? If not, is there even any reason to shoot at them for defensive fire? A: No, they can’t be stopped by normal Defensive Fire. But if the Lethal Defensive Fire rule from the Expanded Rules is used, then there is a reason to use Defensive Fire against them. You could score enough successes to get two hits. Then they would be removed in the casualty phase. Q: If a friendly Soldier is mounted on a transport, can a hero deploy into the same hex at the beginning of the movement phase?